ZorgGemak B.V. is a spin off of Vivici B.V., which developed an award winning decision (support) systems for the primary care. Since it became clear that advanced decision (support) systems only can function in the presence of a high quality and semantic interoperable electronic patient record, our joined focus is not only to deploy such an EPR, but to provide user applications which use the advanced capabilities of such an ‘future proof’ EPR. The latter is the main focus of ZorgGemak BV. Based on our own experiences, that of others, and by studying the literature it has become clear that if one wants to integrate data fusion, decision support and workflow management radical innovative systems are required. By radical innovative we mean systems, which have the functional requirements for such complex tasks already woven into their architecture. It’s our firm believe that re-engineering existing system which aren’t natively designed for such purposes is not only extreme cumbersome but also setting up for failure. 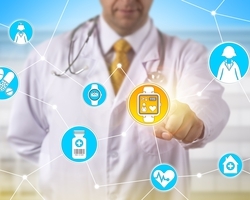 For a functional embedded system that supports workflow management and decision support, first and foremost it is required to be able know the actual clinical state of the patient at any moment (i.e. is the medication prescribed, dispensed, administered or aborted). This function needs to be embedded in the EHR.